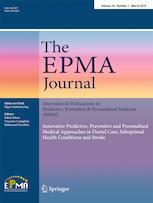 EPMA Journal is a journal of predictive, preventive and personalized medicine (PPPM). The journal provides expert viewpoints and research on medical innovations and advanced healthcare using predictive diagnostics, targeted preventive measures and personalized patient treatments. The journal is indexed by PubMed, Embase and Scopus.